The wide open space of the Sibu Town Square offers plenty of space for landing as well as for spectators to watch this yearly base jumping event. Fringe activities are also organised and they vary from year to year. BASE jumpers from arround the world have found Sibu BASE Jump to be a unique and enjoyable event with a very welcoming atmosphere. Experiencing local cultures is always incorporated in the event programme, which jumpers have enjoyed tremendously. This base jumping event has been organised since 2009. It has since gone on to become a main stay in Sibu’s calendar of events, putting this riverine town on the base jumping map in the region. This event is one of the two events in Malaysia, the other being the KL Tower Base Jump. B.A.S.E is an acronym for buildings, antenna, span and earth and these are the four fix objects, jumpers potentially leap from while taking part in the sport. 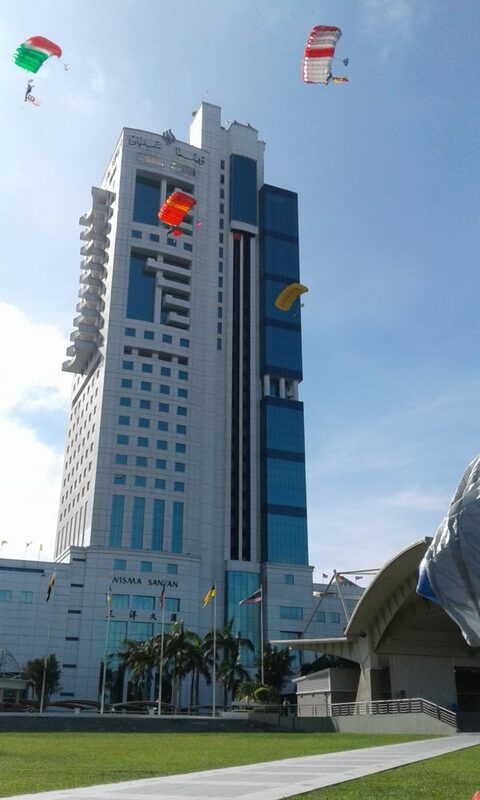 BASE jumpers launch from the top of Wisma Sanyan and land in Sibu Town Square. Wisma Sanyan is the tallest building in Sarawak which stands at 126 meters. This event is organised by Sibu Tourism Task Force Group with technical support by BASE Jumper from Australia and Malaysia. Sibu Base Jump is planned to be carried out just a week before KL Tower Jump. Some of the countries represented at the Sibu Base Jumping event have been from Russia, France, Canada, United States, Germany, Finland, United Kingdom, Belarus, Belgium, Australia, Ireland, New Zealand, Estonia and also Malaysia. Sibu is located in the East Malaysian state of Sarawak on the island of Borneo. To visitors, Sibu feels more down-to-earth than relaxed Kuching. There is still something of the pioneer style about the town, and its people are direct, plain-speaking and assertively friendly. Of course, their smiles may be partly due to the belief that Sibu has more millionaires per capita than any other city in Borneo.